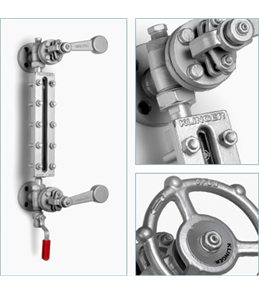 The Klinger Reflex Level Gauge is available in the range ANSI Class 150 to ANSI Class 1500, it is particularly suited for low pressure steam boilers, gas liquefaction plants, reactors or storage vessels. The Reflex glass allows light to be absorbed in the liquid space giving a dark appearance and reflected in the gas space, thereby providing a clear indication of the liquid level. Reliable performance on cyclic duty. Left or right handed gauges available.